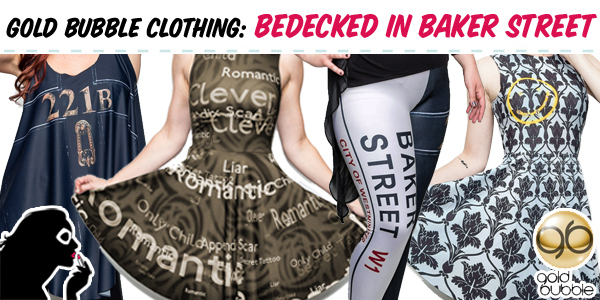 Bedecked in Baker Street – The New Collection from Gold Bubble! The long -awaited new Sherlock Holmes inspired collection from Gold Bubble is finally here! Originally slated to release back in February, manufacturing upgrades and changes forced a hold on the collection until a later time. Now officially on sale, the collection consists of 15 pieces, ranging from a return of their popular “Bored” print, to new designs taking inspiration straight from Baker Street. Check out some of the new looks after the cut!